As Texas lawmakers reconvene for a special legislative session, IBM and other major companies are re-upping their opposition to legislation they say would discriminate against transgender children and harm its Texas recruiting efforts. In an internal memo sent Monday to thousands of employees around the world, IBM's human resources chief outlined the New York-based company's opposition to what the letter described as discriminatory proposals to regulate bathroom use for transgender Texans. IBM sent the letter to employees the same day it dispatched nearly 20 top executives to the Lone Star State to lobby lawmakers at the state Capitol. A day earlier, it took out full-page ads in major Texas newspapers underlining its opposition to legislation that Lt. Gov. 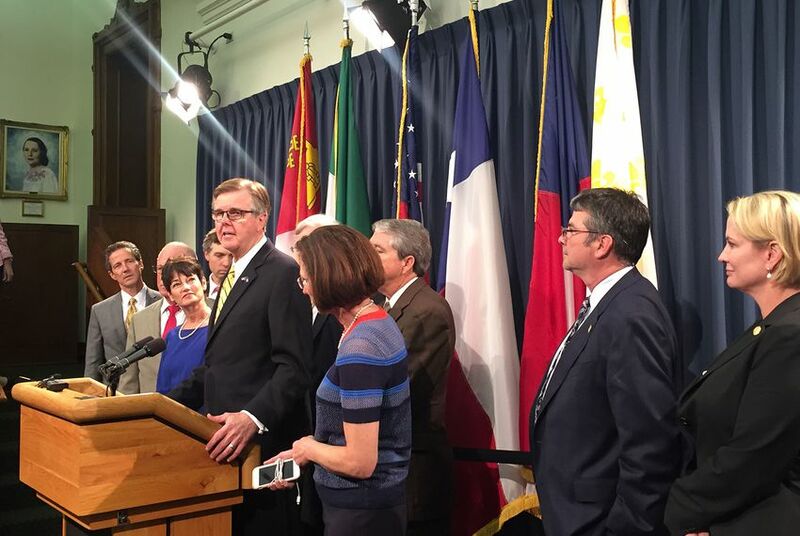 Dan Patrick and a cadre of far-right lawmakers have deemed a top priority. But similar proposals that would nix trans-inclusive bathroom policies enacted in recent years by Texas cities and school boards have already been filed for consideration during the special session, at the behest of Gov. Greg Abbott. Abbott has said a statewide rule "protecting the privacy of women and children" is necessary to avoid "a patchwork quilt of conflicting local regulations." "At a minimum, we need a law that protects the privacy of our children in our public schools," the Republican said in June. The fate of such a policy could once again come down to Straus, who has in the past raised similar business-focused concerns. More recently he has framed such legislation as concerning because of the detrimental effect they could have on transgender children who he has acknowledged as especially vulnerable. Last week, IBM's CEO Ginni Rometty spoke with Straus directly over the phone about the issue. “This legislation threatens our ability to attract and retain the best talent in Texas, as well as the greatest sporting and cultural attractions in the world,” the CEOs wrote. The revived push from big business comes after House leadership in particular questioned why businesses executives didn’t lobby harder against proposals to regulate bathroom use during the regular session. For months, the business community has largely acted through business coalitions promoting LGBT-inclusive policies, instead of CEOs and top executives attaching their own names to the cause. At the tail-end of the regular legislative session, IBM was among several prominent corporations, including Apple and Facebook, that penned a letter to Abbott expressing staunch opposition to legislation they described as discriminatory and bad for business. The memo IBM sent to employees on Monday echoed concerns businesses voiced in their letter to Abbott earlier this year, saying the company — which has more than 10,000 employees in Texas — is focused on defeating the bathroom proposals because they're detrimental to inclusive business practices and fly in the face of "deep-rooted" values against discrimination targeting LGBT people. “A bathroom bill like the one in Texas sends a message that it is okay to discriminate against someone just for being who they are,” Gherson, the company's HR chief, wrote. Disclosure: AT&T and BNSF Railway have been financial supporters of The Texas Tribune. A complete list of Tribune donors and sponsors can be viewed here.